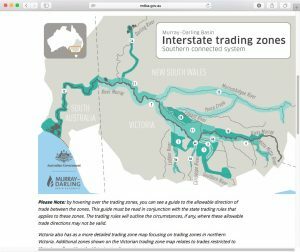 A trading zone is a defined geographical area within a section of a river catchment. 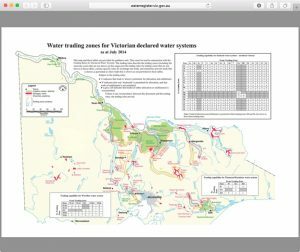 Within the trading zone irrigators can trade their water entitlements to each other. Each state sets out the boundaries for the trading zones. 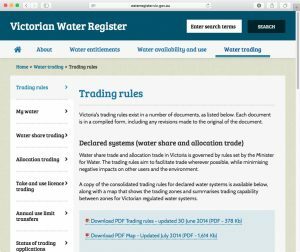 Trading rules define what water entitlement are allowed to be traded out of the trading zone and into different trading zones. Sometimes water can be only trading in one direction. 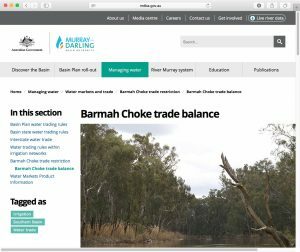 Once this water is traded in that direction, a back trade is then allowable. Unsure what trading zones you can trade from?